August 4, 2013 - The NTSB has ruled that pilot, Todd Parfitt, 50, lacked recent flight experience which lead to his death and the death of his daughter, Nicole Parfitt, 14, after their aircraft entered into an accelerated stall and then crashed west of Burlington Municipal Airport, Wisconsin in a Grumman AA-1B, N6273L last November. On November 18, 2012, 1:30 PM, Parfitt who had been employed as a dispatcher for United Airlines was approaching Burlington Municipal airport from the southwest to land on runway 11. At or about that time, a pilot of another aircraft reported on the common traffic advisory frequency (CTAF) that he was departing the airport on runway 29. A witness said he saw Parfitt in a steep descent with a slight left turn. A few moments later he saw the aircraft in a tight, right turn that developed into a spin at which point the Grumman AA-1B then rapidly descended and then crashed in a muddy field about quarter mile west southwest from the threshold of runway 11. The crash caused a crater which contained the engine, propeller, and a majority of the cockpit instrumentation. The main wreckage was two feet west of the impact crater. Impact signatures were consistent with a nose-low impact. The fuselage was torn and broken forward of the pilot seat. Both wings displayed accordion crushing. The right wing fractured from the fuselage at the wing root. The right aileron and flap remained attached to the right wing. The fuselage and empennage were buckled and distorted. The vertical stabilizer, horizontal stabilizers, rudder, and elevators were unremarkable. Parfitt held a private pilot certificate with a rating for single-engine land with 290 total hours, with 7 hours in the preceding six months. Parfitt had received a Special Restriction third class medical certificate with the restriction that it was not valid for any class after July 31, 2013, due to the pilot’s treatment of psoriatic arthritis. An autopsy was conducted on Parfitt by the Walworth County Coroner’s Office which noted the cause of death was due to a massive trauma caused by the crash. The autopsy also noted the presence of cardiomegaly, a medical condition wherein the heart is enlarged. The pilot’s log book was recovered and the most recent log book entry was May 30, 2012, when the pilot logged four landings and 1.2 hours of flight time. 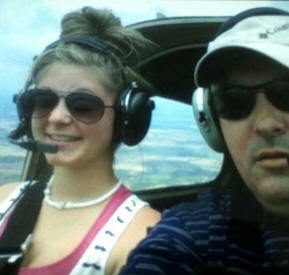 There was no record of the pilot flying in the preceding 5 months. According to logbook entries, the pilot had flown five flights during 2010 (for a total of 5 hours) and four flights during 2011 (for a total of 4.8 hours). Accelerated Stalls - An excerpt from the FAA’s “Airplane Flying Handbook,” 2004, (the airplane will, however, stall at a higher indicated airspeed when excessive maneuvering loads are imposed by steep turns, pull-ups, or other abrupt changes in its flightpath. Stalls entered from such flight situations are called “accelerated maneuver stalls,” a term, which has no reference to the airspeeds involved. Stalls which result from abrupt maneuvers tend to be more rapid, or severe, than the unaccelerated stalls, and because they occur at higher-than-normal airspeeds, and/or may occur at lower than anticipated pitch attitudes, they may be unexpected by an inexperienced pilot. On March 2013, the NTSB held a general aviation safety forum. One of the safety alert issues (Safety Alert SA-019) was the prevention of aerodynamic stalls at low altitude. This alert provided recommended tools to avoid this accident potential.